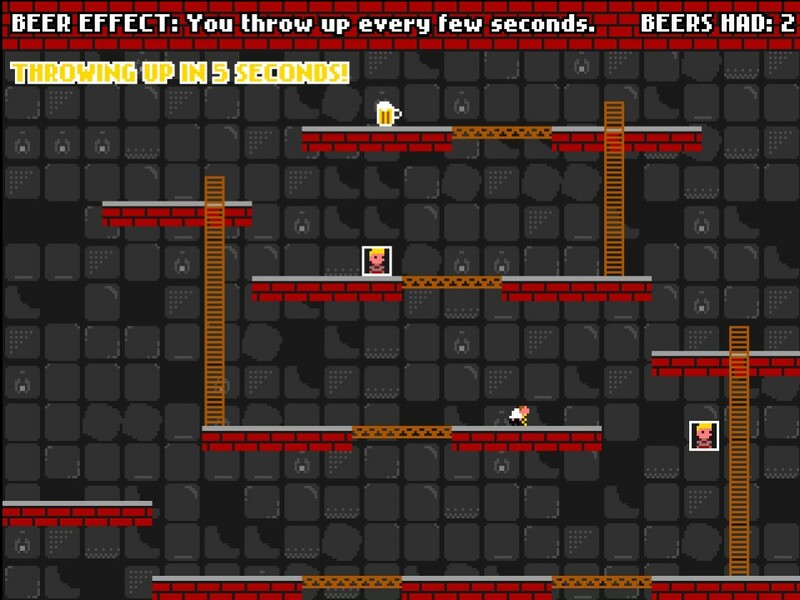 Drink Beer Neglect Family by esayitch is a platformer game where the goal is to drink as many beer as possible while enduring the effects it and avoiding family member! You are a depressed father who spends most of his time drinking beer and avoiding his family. How long can you avoid them, and at what cost? Every beer you drink increases your score, and applies a different effect. Some beers make you unable to jump, some make you fall off of bridges, some make you throw up every few seconds, and so on. On top of that, pictures of your family pop up everywhere. You need to avoid them, so they don't remind you of your duties as a father and a husband. Drink Beer Neglect Family is not your ordinary game. It may look simplistic like an old 8-bit game from NES era. However, looks can be deceiving. This game is hilarious and fun to play. 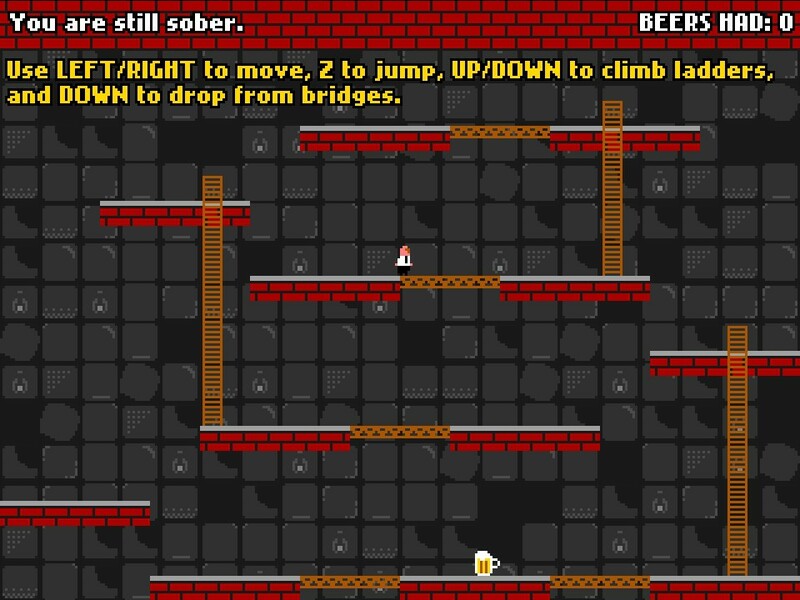 Your are to control a dude to get as many beer as possible by navigating through the platforms. As you drink the beer, you immediately find out that beer is bad for you. You will start having side effects such as reverse control, puking, unable to climb ladders and many more. Adding to the challenge of the game, there are flying photos of your family that you need to avoid. 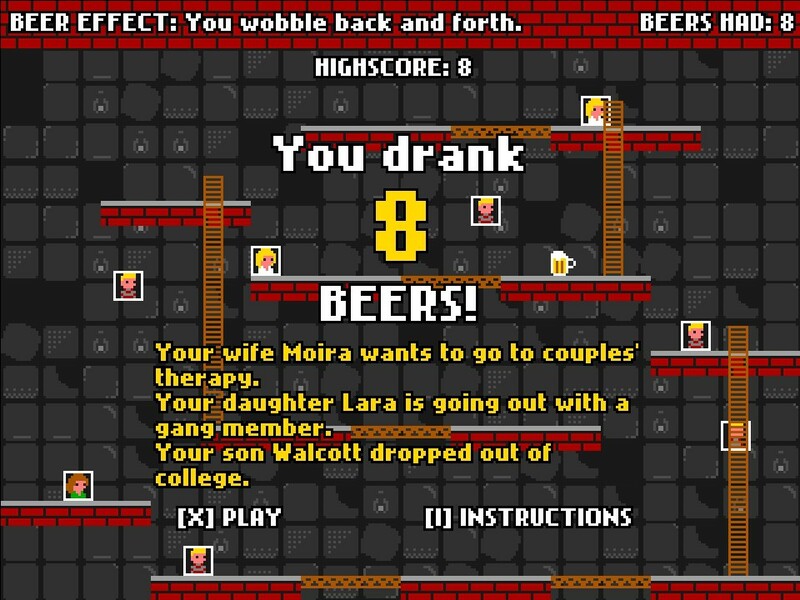 Overall, Drink Beer Neglect Family is a total blast to play. The side effects are what glued the game together to become something that is addictive and challenging to play. The game is full of dark humour that most can relate to! Recommended!